Nikon make a tremendous set of binoculars in the Monarch ATB series. I was drawn to this model after Cornell Lab reviews that consistently place these binos in the same league as models many times their price. I work and photograph in some pretty hostile environments – from the Arctic to the Antarctic, to remote parts of the New Zealand wilderness, and deliberately chose the lower priced model thinking I could wreck or lose several binoculars for the price of one Leica, Zeiss or Swaroski. But alas, after a few years they’re still going strong after hardy service in salty coastal areas, mountains and near the Poles. But for one weakness, a broken eye cup ring (a common problem I believe because of the very thin plastic design and normal wear and tear) they have been excellent. 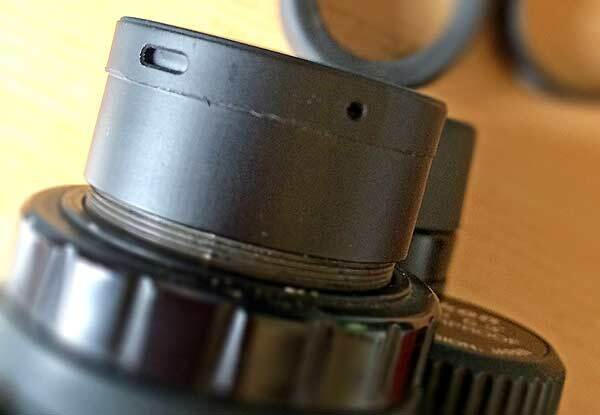 I was initially drawn to Don Enright’s post about replacing the eyecups and would have used his post to make repairs, but have found there are… some important changes to replacement eye cups – hence this new post. I contacted the Nikon agent in New Zealand about parts. They had to get special permission from Nikon to be allowed to sell the parts without the repair being done in house. After showing them Don’s post, and convincing them of my competence in mucking with stuff, they set out ordering. It sounds like they found it hard to get the right part numbers, possibly due to the various models (see below for part numbers). Fortunately it appears that the eye cups are fairly universal. The parts arrived (about NZD$50.00 incl GST and shipping) and I immediately found they were significantly different to the originals. Nikon have obviously tried to improve their design ( but it doesn’t actually look like they’ve strengthened the weakest part). Oh well, the tiny ball bearings that click lock the rotated eye cup into place have gone – they fell out a long time ago, and are now small rollers; hopefully these will be better? Remove the old eye cups by screwing the whole unit (rotating rubber eye cups and base ring) CLOCKWISE (opposite threaded to normal). Screw the new base ring on ANTI-CLOCKWISE but only a few turns, as you’ll need to rotate yet to get the bits in. Slip the rotating ring over the base ring (make sure you have it the correct way up) and then angle it so that you can drop a metal roller into the slot (left photo below). Do this 3 times with all the rollers by angling the roating ring to stop the previous rollers from falling out. I suggest you do this over a surface where you will find a roller if it gets away! Then install the three small screws through the rotating eye cup and into the base ring. Once all three are installed then carefully turn the whole unit down (screw ANTI-CLOCKWISE) and tighten it into place. Becareful not to overtighten as you may crack the base ring again. However, you will need to tighten it enough to stop it unscrewing when you adjust the stiff new eye cups. Install the rubber eye cups over the unit and you’re done. I note my old eye cups had glue holding the rubber hood on. My new ones are tight and I’ll see how I go without glue for a while. I also wonder about putting some loctitie or similar under the base ring to stop it unscrewing in the field, but have chosen not to at the moment – I’d hate to compromise the intregity of the weak ring below. 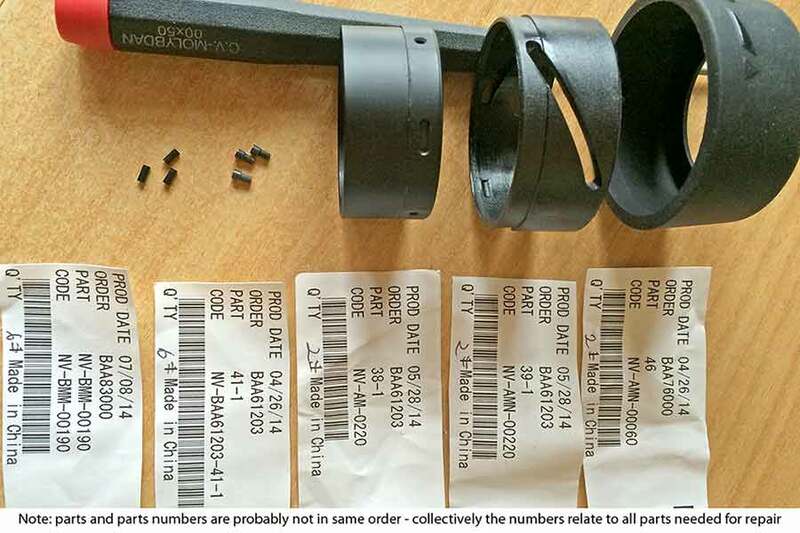 I’ve photographed the parts packets I recieved from Nikon in case anyone wants to get part numbers. Note that I can’t be sure which parts came in which paackets sorry. But it should give your parts people enough to get started with. Well, hopefully if you’ve been in the same boat as myself (and Don Enright), you don’t chuck out your good bins, a 15 minute repair will see you up and running again. Good Spotting! are you able to tell me who you got the parts through as im struggling to find the agent. Thank you for this very useful post. You saved my cake! Now, a note regarding the small rubber rollers. After several years my eyecups (Monarch 5 8×42) have become very stiff. Curiously it happened to both at once. It might be the rubber drying out, maybe with dust making it worse, and/or high temperatures (Southern Spain is hot in Spring and Summer). Anyway I have restored them to fully operational state just lubing the rollers with a bit of vaseline grease. Now they are smoother than they ever were. I wonder: did yours become stiff, so much that you forced the threads? I am asking because one of mine became so stiff it unscrewed when I tried to twist them. Thank you for all this. I am mostly very pleased with my Nikon Monarchs… but this eye-cup problem is sad. I was lucky the first time the eye relief cup screws came out: they were caught in the track and I was able to put everything back. But on a trip I lost two of three screws on one side, so I glued the cup in the out position that is my norm for wearing contacts… so now this is not usable with my backup glasses. Now home, I look at the other side, and 2 of the 3 screw slots are open at the base so will give way soon: more glue. BUT WHY DOESN’T NIKON JUST SELL us replacement eyecups fully assembled & ready to screw on? What is that about? 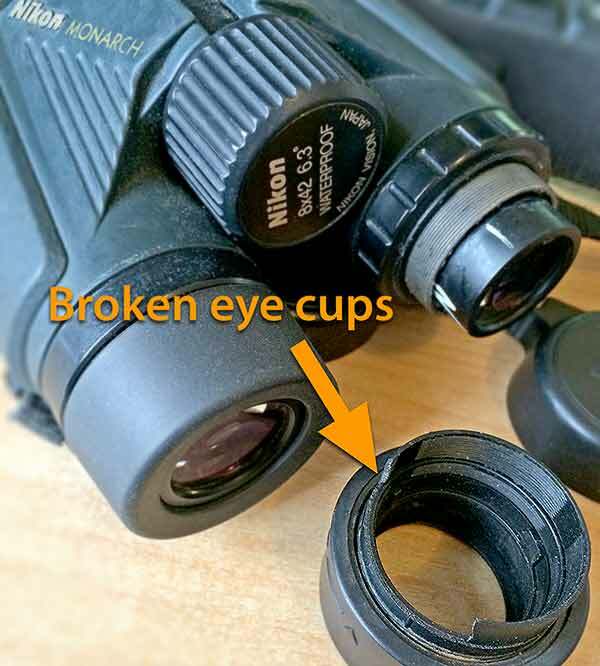 You're reading Nikon Monarch ATB Binocular Broken Eye Cup Replacement at Nature’s Pic Images Blog.